With a third No. 1 spot in Sierra magazine’s “Cool Schools” ranking and top distinctions in the Association for the Advancement of Sustainability in Higher Education’s prestigious STARS program, the University of California, Irvine has earned its place as the sustainability leader among U.S. universities. Today’s “Cool Schools” triumph makes UCI the only campus to score in the top 10 for nine consecutive years, placing first in 2014 and 2015 and tying for No. 1 this year with Vermont’s Green Mountain College on the strength of its curriculum, research, campus operations and public engagement. And just last week, the AASHE released its 2018 Sustainable Campus Index, an annual publication recognizing top-performing institutions in various sustainability impact areas, as measured by the Sustainability Tracking, Assessment & Rating System. In receiving the esteemed STARS Platinum rating – one of only four campuses to do so – UCI claimed first place overall for doctoral-granting universities, accruing the highest merit score among all North American schools. It’s also No. 1 in green buildings and in research (a tie with UC San Diego). The official publication of the Sierra Club, the magazine initiated the college sustainability rankings in 2007 because – as the biggest purchasers and employers in many communities – campuses can create demand for green services and products and lead by example. This year, Sierra rated 269 institutions in 19 categories, ranging from teaching and research to public engagement and campus operations. With more than 800 participants in 30 countries, the AASHE’s STARS program is the most widely recognized framework in the world for publicly reporting comprehensive information on a college’s or university’s sustainability performance. Top schools are featured in the Sustainable Campus Index. Unlike other ranking systems, the program is open to all institutions of higher education, and the criteria that determine a STARS rating are transparent and accessible to anyone. Because STARS is based on credits earned, it allows for both internal comparisons and comparisons with similar schools. UCI has a long history of environmental and sustainability leadership dating back to the Nobel Prize-winning research of F. Sherwood Rowland into the depletion of the ozone layer almost five decades ago. His work led to the development and growth of UCI’s culture of sustainable practices, groundbreaking research and extraordinary accomplishments that has placed the campus at the very forefront of American higher education. As part of a competition funded by the California Energy Commission, UCI’s Advanced Power & Energy Program has spearheaded a novel partnership with Huntington Beach, California, to develop and demonstrate a replicable, economic and safe method for converting low-income neighborhoods into models of energy efficiency. APEP’s Scott Samuelsen and Jack Brouwer are leading the effort. Led by researchers Donald Blake and Michael Prather, UCI has been a key contributor to climate protection public policy developed through the United Nations’ Intergovernmental Panel on Climate Change and the World Meteorological Organization. Methane data provided by Blake – via the longest-running global methane research program in the world – is used as an important source for IPCC and WMO assessments and policy. UCI researchers have invented nanowire-based battery material that can be recharged hundreds of thousands of times, moving us closer to a battery that would never require replacement. The breakthrough work could lead to commercial batteries with greatly lengthened lifespans for computers, smartphones, appliances, cars and spacecraft. UCI doctoral candidate Mya Le Thai, under the direction of UCI chemist Reginald Penner, cycled the testing electrode up to 200,000 times over three months without detecting any loss of capacity or power and without fracturing any nanowires. Scientists and engineers at UCI have discovered what appears to be an earlier and more accurate method for projecting wet or dry weather in California and the southwestern U.S. in the winter ahead. It is based on an interhemispheric teleconnection that the research team calls the New Zealand Index. Involved faculty include Efi Foufoula-Georgiou, Amir AghaKouchak, James Randerson and Jin-Yi Yu. UCI historian Kristina Shull leads the Climate Refugees: Environmental Justice Detained project, a multimedia narrative and archiving effort comprising a series of short animated films on the stories of “climate refugees” – people who have been forced to flee their homes due to the direct or indirect impacts of climate change. 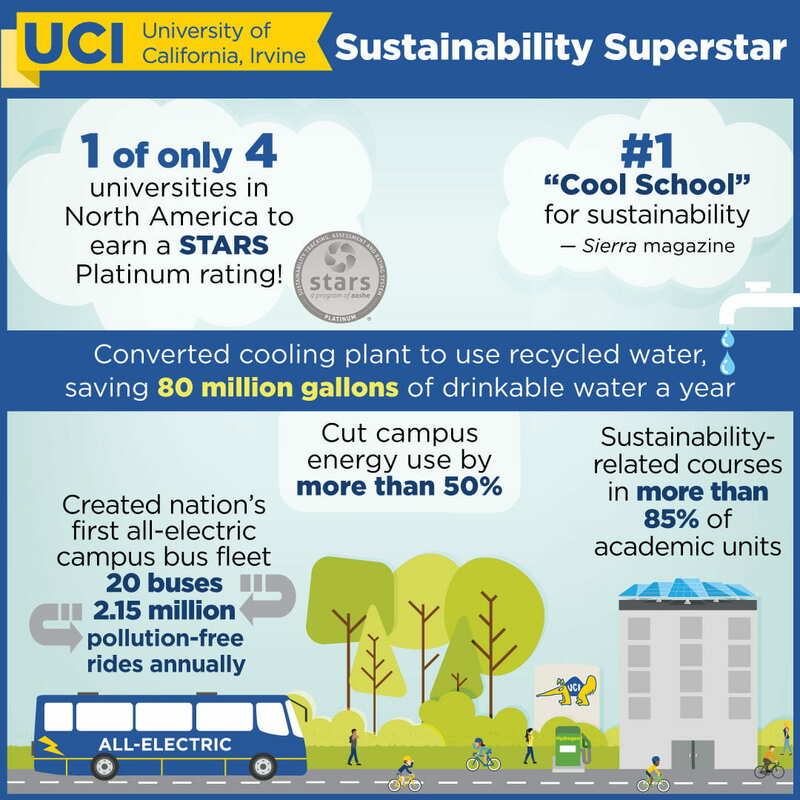 UCI has 17 new-construction LEED Platinum buildings, the most of any U.S. campus. UCI rolled out the first all-electric bus fleet in the nation. The student-funded and student-operated Anteater Express shuttle service employs 20 buses, which join a hydrogen electric bus to provide more than 2 million pollution-free rides annually. Partnering with the Irvine Ranch Water District, UCI completed the conversion of its central plant to use reclaimed water for cooling campus buildings. The new, environmentally friendly system will conserve more than 80 million gallons of drinkable water per year.